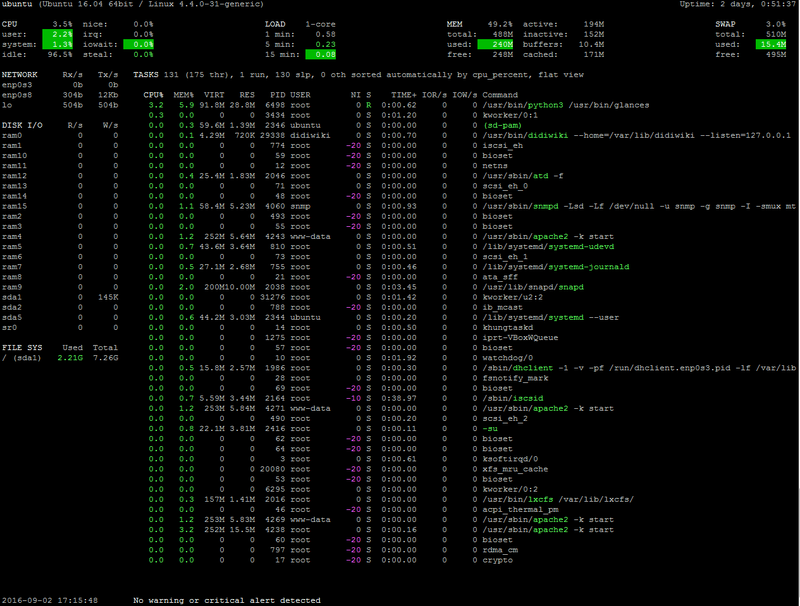 Glances is a cross-platform curses-based monitoring tool which aims to present a maximum of information in a minimum of space, ideally to fit in a classical 80×24 terminal or higher to have additional information. It can adapt dynamically the displayed information depending on the terminal size. It can also work in client/server mode. Remote monitoring could be done via terminal or web interface. Glances is written in Python and uses the psutil library to get information from your system. 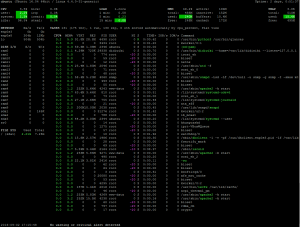 Written in Python, Glances will run on almost any plaftorm : GNU/Linux, FreeBSD, OS X and Windows. Glances includes a XML-RPC server and a RESTFUL-JSON API which can be used by another client software. No terminal at hand ? Use the built-in Web UI and monitor your system from any device. Export all system statistics to CSV, StatsD, InfluxDB, ElasticSearch or even RabbitMQ. Glances also provides a dedicated Grafana dashboard. Press ESC or “Ctrl + C” to quit from the Glances terminal. By default, the interval time is set to 1 second, but you can define the custom interval time while running glances from the terminal. You can check glances documentation for more details.